Flooded with light! Premier 03 Tier!! Absolutely stunning unobstructed views of the park, lake and city from the rarely available 03 tier! 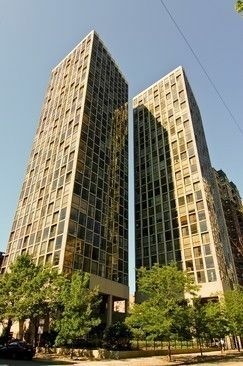 Southeast corner unit w/floor to ceiling windows is sleek, highly rehabbed/upgraded and in impeccable condition with wide plank hardwd throughout, Gorgeous open cooks kitchen w/custom cabs, quartz counters, new wine fridge, euro style baths, hi-tech lighting, generous storage. Too many upgrads to list! Wake up to the sunrise in the King Size Master Suite w/new marble bath and great closet space! Queen Size guest room enjoys views of the skyline! Enjoy panoramic views in phenomenal LP location-Hancock, Bloomies, Navy Pier and more! full service building. Parking avail immediately. Pets ok to 25lbs. Rental restrictions. Doorman, exercise room and sundeck.